WASHINGTON (AP) — After 20 years, the nutrition facts label on the back of food packages is getting a makeover. 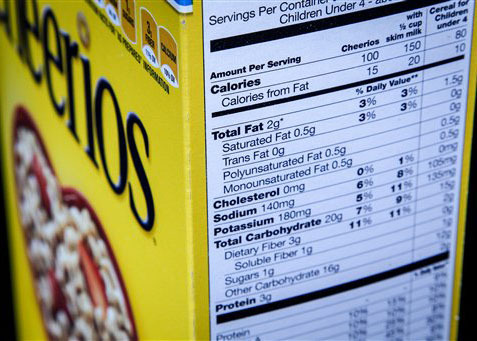 The nutrition facts label on the side of a cereal box is photographed in Washington, Thursday, Jan. 23, 2014. 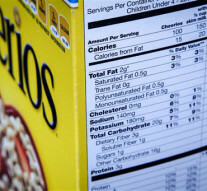 Nutrition labels on the back of food packages may soon become easier to read. The Food and Drug Administration (FDA) says knowledge about nutrition has evolved over the last 20 years, and the labels need to reflect that. For example, he says, most of the nutrients are listed in grams, a basic unit of the metric system. Jacobson says people don’t really understand what a gram is. Michael Taylor, the FDA’s deputy commissioner for foods, says 20 years ago “there was a big focus on fat, and fat undifferentiated.” Since then, health providers have focused more on calories and warned people away from saturated and trans fats rather than all fats. Trans fats were separated out on the label in 2006. The revised label is expected to make the calorie listing more prominent, and Regina Hildwine of the Grocery Manufacturers Association said that could be useful to consumers. Her group represents the nation’s largest food companies. Hildwine said the FDA also has suggested that it may be appropriate to remove the “calories from fat” declaration on the label. It’s not yet clear what other changes the FDA could decide on. Nutrition advocates are hoping the agency adds a line for sugars and syrups that are not naturally occurring in foods and drinks and are added when they are processed or prepared. Now, some sugars are listed separately among the ingredients and some are not. — Clearer measurements. Jacobson of the CSPI and others have suggested that the FDA use teaspoons, as well as grams, for added sugars. — Serving sizes that make sense. There’s no easy answer, but health experts say that single-size servings that are clearly meant to be eaten in one sitting will often list two or three servings on the label, making the calorie and other nutrient information deceptive. The FDA said last year that it may add another column to the labels, listing nutrition information per serving and per container. The agency may also adjust recommended serving sizes for some foods. — Package-front labeling. Beyond the panel on the back, nutrition experts have pushed for labels on the package front for certain nutrients so consumers can see them more easily. The FDA said several years ago it would issue guidelines for front of pack labeling but later said it would hold off to see if the industry created its own labels.